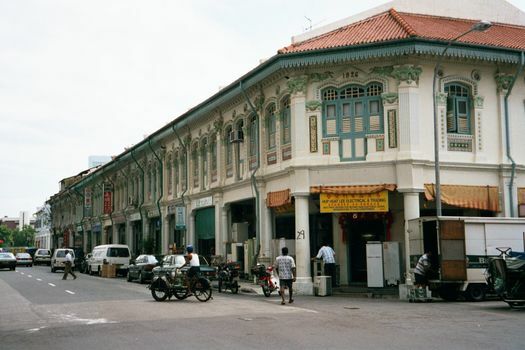 Raffles had very clear ideas about the kind of town he wanted to establish: shipping on the river, a Chinatown on the right bank (using the Malay word for village he called it the "Chinese campong,"), a government area on the left bank--and, beyond it, what he called the "European town." Still farther out, there would be an "Arab campong." All were to lie on neatly gridded streets. The streets survive, as streets everywhere do: changing them means changing property ownership, after all. 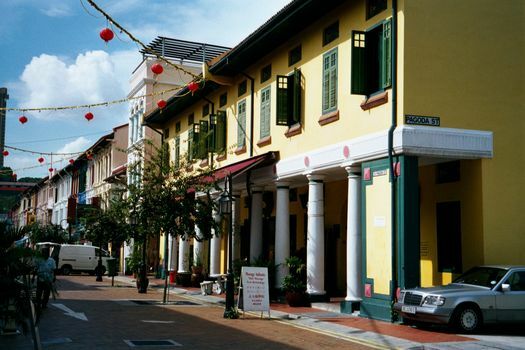 The Chinese, however, were so numerous that they soon pushed the Europeans out of European Town to more northerly places like Tanglin--today a wealthy residential area. Indians soon arrived, mostly from what was then Madras. 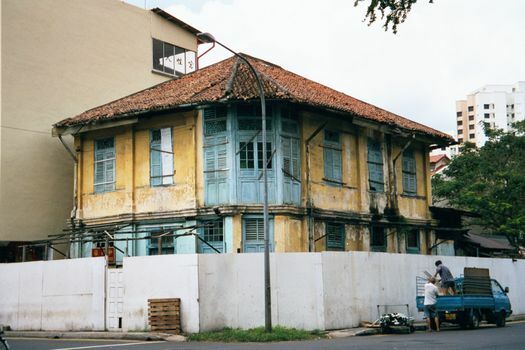 Within the last 20 years, and after a period of fairly merciless urban renewal, Singapore has begun rehabilitating the remnants of its colonial past, whether European, Chinese, Arab, or Indian. 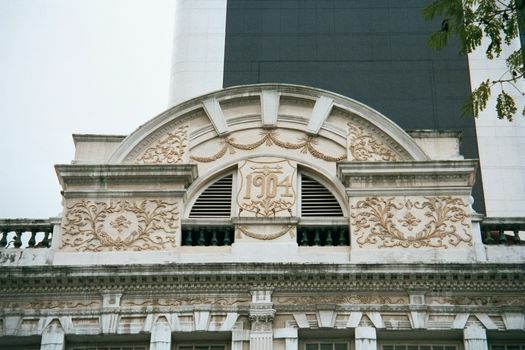 Heritage preservation has become a very big and profitable business. 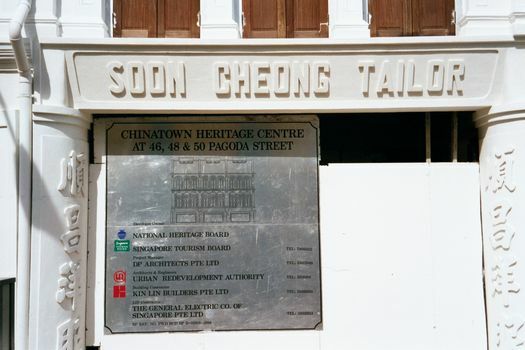 Even the old port, once crammed with lighters, is now thoroughly proper--so clean and lifeless that it gives ammunition to Singapore's critics. Singapore was always about trade--which is to say also about infrastructure. 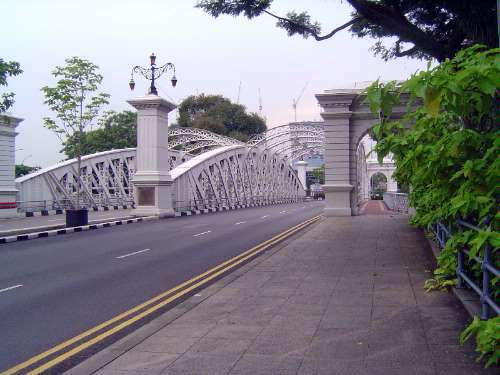 Here, the oldest of the many bridges across the Singapore River. On the crossbar between the towers you can make out the back of a sign. "Peace and wealth" is still an appropriate motto. 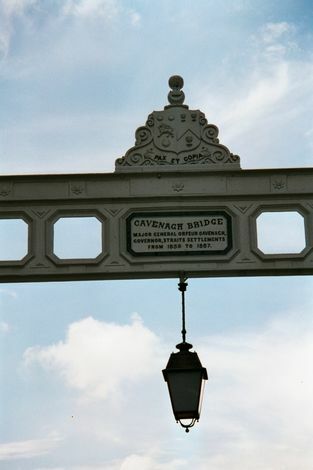 The bridge is named for Orfeur Cavenaugh, who was appointed as Governor of the Straits Settlements by the East India Company in 1859. 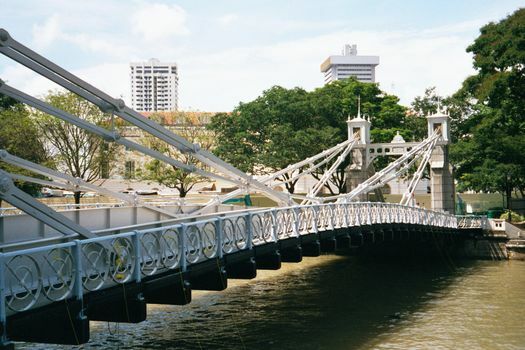 The bridge was built in 1867 to commemorate the establishment of the Straits Settlement as a crown colony. 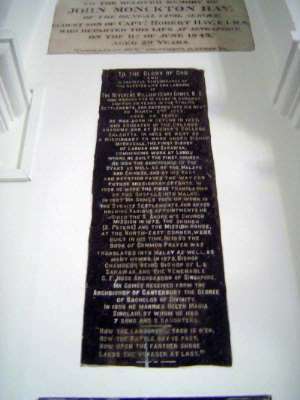 The builder's plate. 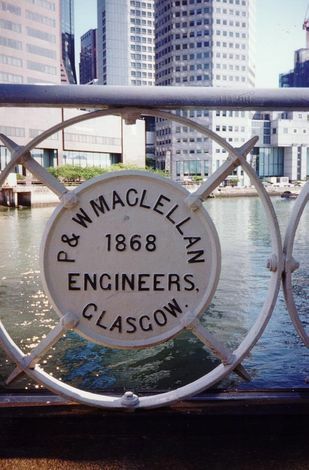 The bridge originally carried trams; now it is restricted to pedestrians. Downstream, the Anderson Bridge, 1909. 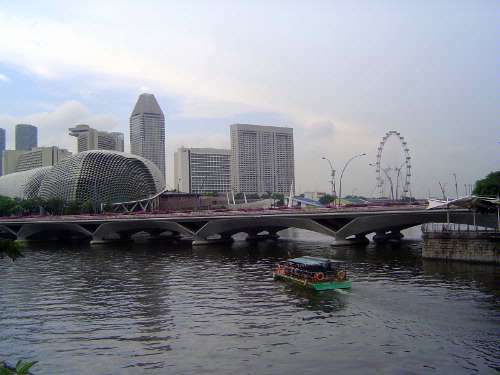 A new bridge at the mouth of the river, with the Esplanade Theaters at the left. 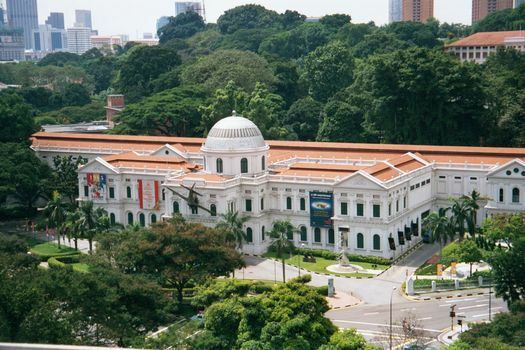 The National Museum, built for Victoria's Diamond Jubilee; behind it, Fort Canning Park. 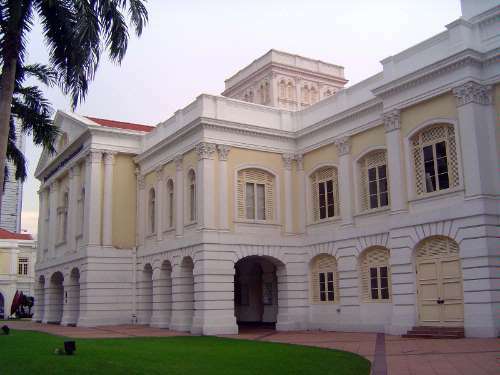 The Old Parliament House, 1827, much modified since then and now an arts center. 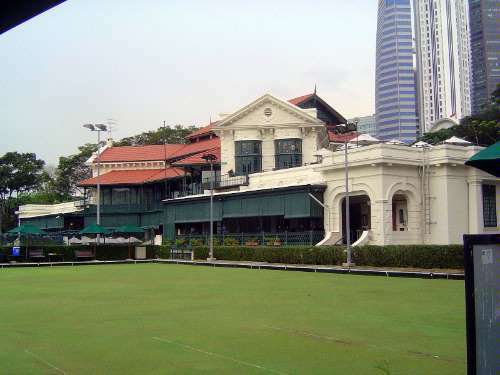 The Singapore Cricket Club. You can walk into the Sind Club in Karachi and get away with it, so long as you don't look Pakistani. Don't try it here. 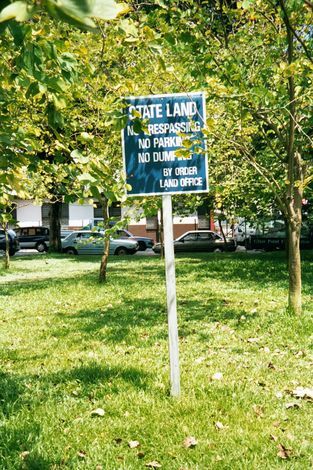 Singapore doesn't take any nonsense from bounders, cads, moochers, gawkers, and bloody deadbeats. 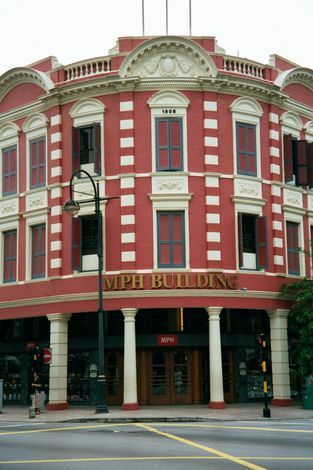 An older commercial building, now a bookstore. Enough of the English. Indians came to Singapore almost as early as Raffles. 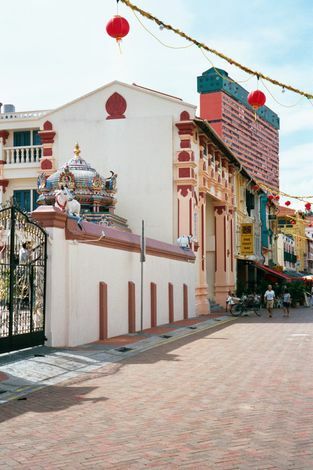 Here, the edge of their first temple (Sri Mariamman), established in 1827. 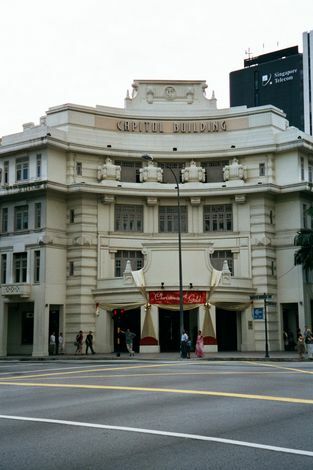 It's in Chinatown, ironically; later Indian immigration would be centered in Raffles' European Town. 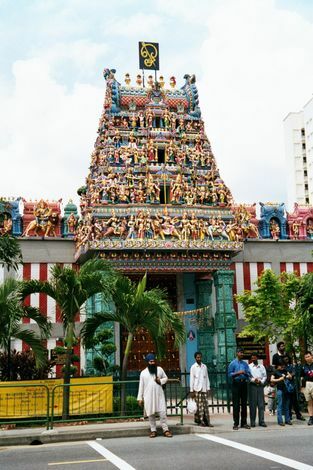 This is the entrance to the Sri Srinivasa Perumal temple, on Serangoon Road. 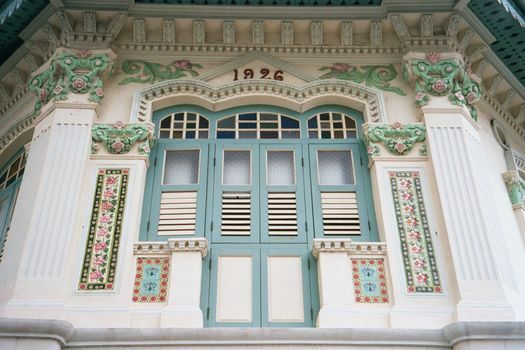 Little India began to grow in the 1880s. 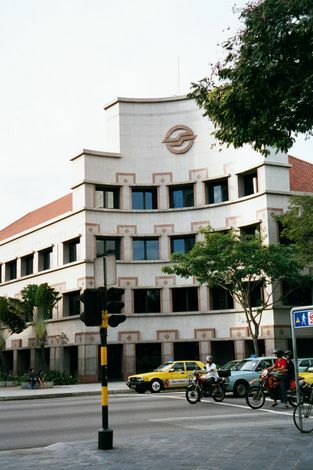 There's a nearby river also called Serangoon, but the ultimate origin of that name is unclear. 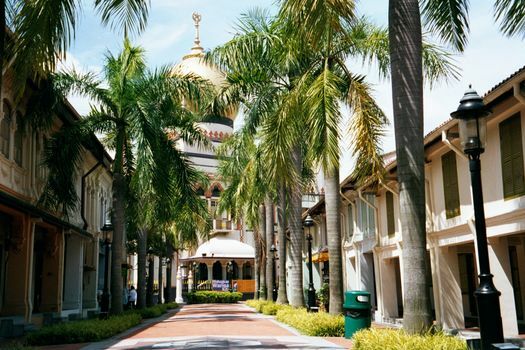 The fourth of the dominant ethnic groups: the dome of the Masjid Sultan hides behind the palm fronds on Bussorah Street, named for a local businessman. "Meet you at the corner of Baghdad and Kandahar." The neighborhood once belonged to an Arab merchant. 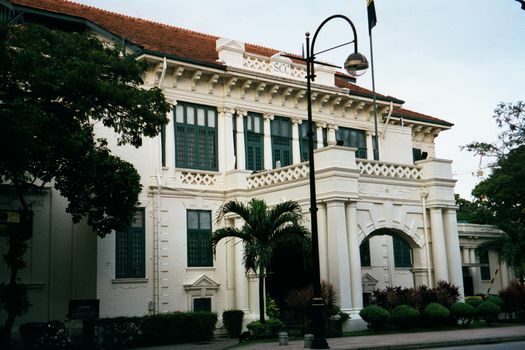 The excellent condition of most surviving colonial structures hints at the heritage boom that makes a building like this a prime investment. Want to see what becomes of such places? 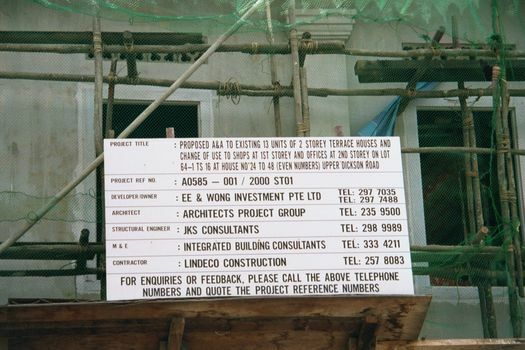 A sign goes up, with information about residential conversion to shops and offices. Plumbing, wiring, A/C, modern communications, paint: ready to go on the market. 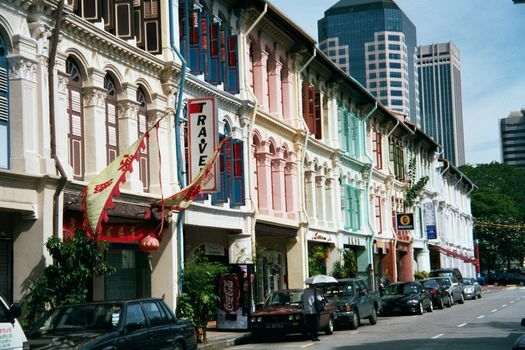 A line of shophouses in Little India. Chinatown, redone from the paving up. 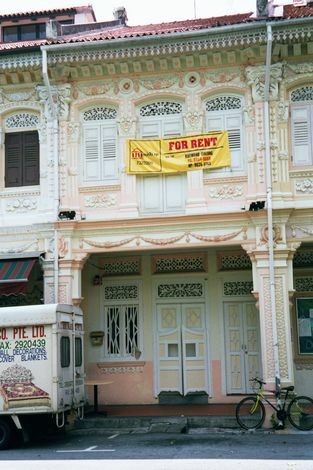 Singapore's planners say that shophouses "create a sense of human scale, rhythm and charm not found in much of our modern architecture." Restoration is a public-private partnership. 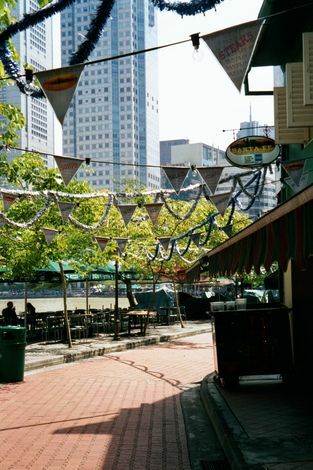 The once colorful but smelly Singapore River has now been prettied up past recognition. Yes, the sign reads Santa Fe. The assumption is that passersby have been there, or at the very least know enough to fake it. The same bend of the river. 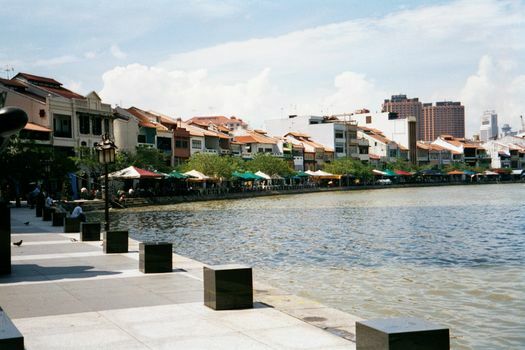 It's Clarke Quay, named in 1896 for Andrew Clarke, governor of the Straits Settlements, 1873-5. It was originally used to unload firewood, but it reopened in 1993 as a "festival village." We all know about architects striving to blend harmoniously with the neighborhood. Case in point: this theater. Across the street: the new bus-company offices. It all works because the government's word is just about law. The sign says no parking or dumping, and, by golly, there's not a gum wrapper in sight. 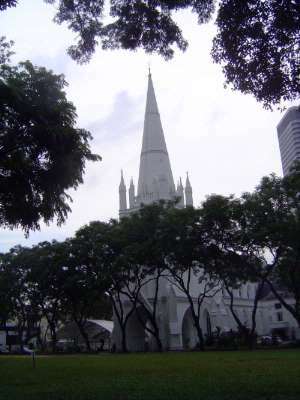 Saved for last: St. Andrew's Cathedral, consecrated 1870. 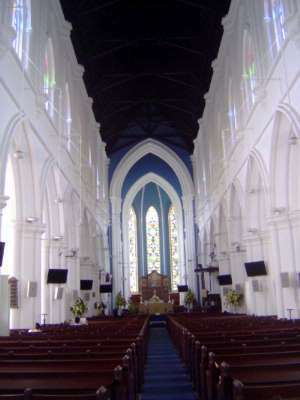 The nave is equipped with flat-panel screens. 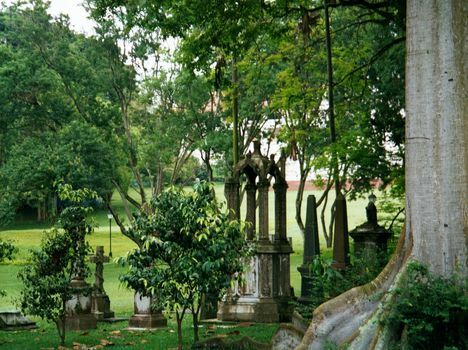 Most of the tombstones have been removed from the old English cemetery in Fort Canning, which is now a very central park. A few survive, pushed to the edge of the lawn. 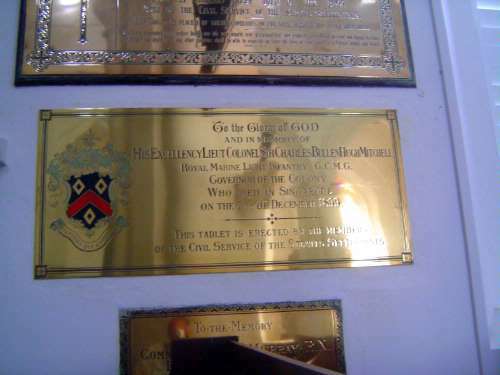 Lots of memorial plaques survive on the cathedral walls, however. 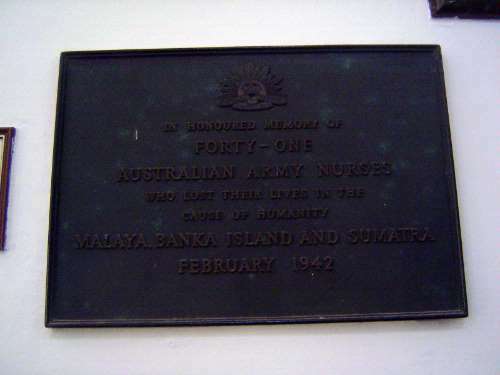 Here's one for a group of Australian army nurses barbarously executed by the Japanese. 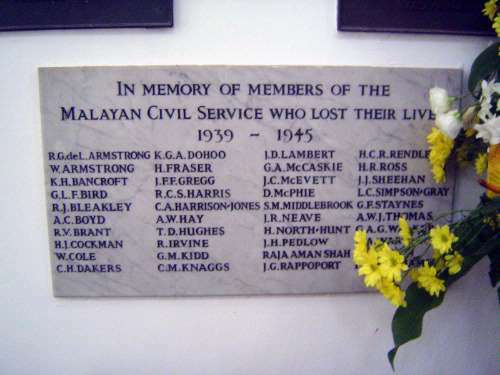 Still another, this time for the men killed in a 1915 mutiny. 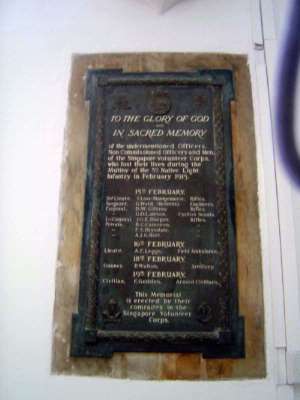 A memorial to a Ceylon-born missionary to Sarawak and translator of the gospels into Malay. 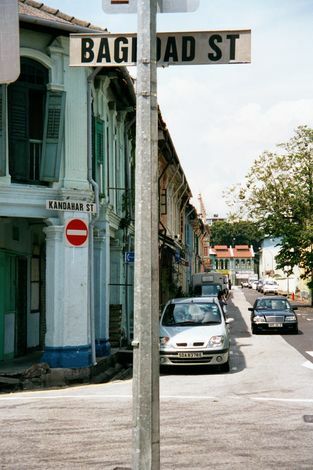 A governor of the Straits Settlement who served in that post for five years and a bit before dying. Death was always close to the colonial experience. 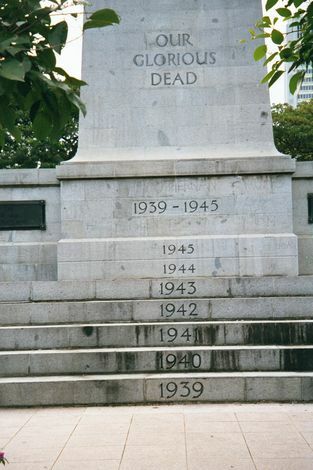 Here, a war memorial emphasizing, step-by-step, the suffering of World War II, when to general astonishment Singapore fell to the Japanese almost overnight. 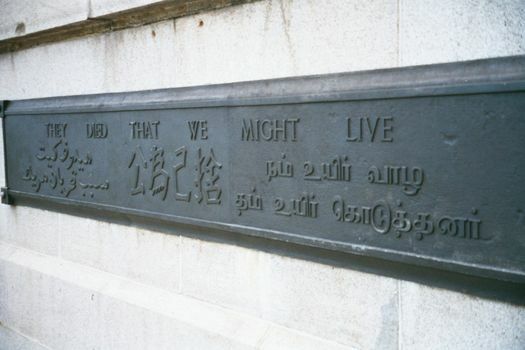 The same monument, but with inscriptions that are a compact reminder of the cultural diversity of Singapore.